We have an exciting new week coming up! Catch up with Larry King on an exciting new lineup of the Emmy-nominated web series "Larry King Now" during the week of Sep 1–4th, 2014. 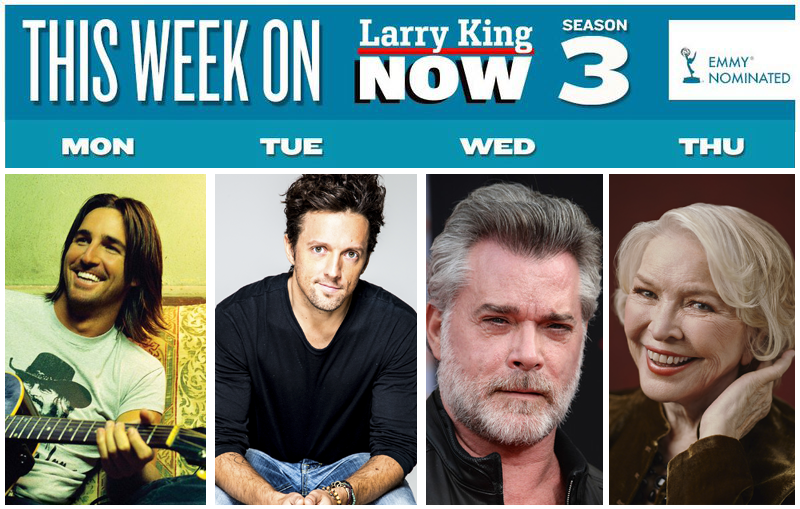 Tune in to an exciting new lineup of“Larry King Now.” Guests this week include American Country music artist Jake Owen, singer-songwriter, activist, and avocado farm owner Jason Mraz, American actor Ray Liotta, and American actress Ellen Burstyn. Don’t forget *NEW* episodes of “Larry King Now” are posted at 5PM ET - but you can watch them after they premiere online anytime on Ora TV & Hulu. And if you want to know more about all the ways you can watch new episodes online, on your tablet or even TV – be sure to check out our “About” page for more info!